Pho is my favourite thing to eat and I tell everybody at every opportunity. I really love beef pho but the complexity of the flavours in the broth is something I haven’t quite mastered in my cooking. 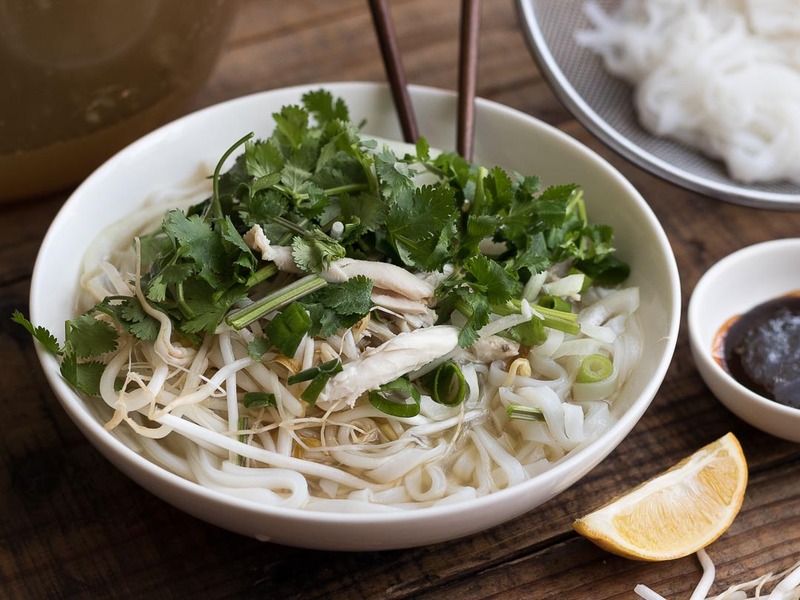 Chicken Pho on the other hand is much simpler and more manageable. Funnily enough I never order chicken pho when I’m at a pho restaurant, I used to think it was the poor cousin of the beef version. The amounts of seasoning is only a guide because when you’re flavouring the broth, you should really taste it as you balance the flavours. Toast coriander seeds, cloves and star anise in a frying pan till fragrant and set aside. Place ginger and onion over a naked flame and roast for approximately 10 minutes till the skin becomes charred all over and the onion softens slightly. This can get messy with fly away onion skin, so I often do this on a portable stove top outside. I’ve also read people putting this under the grill in the oven and rotating it till it’s charred all over. Once the ginger and onion are cool enough to touch, peel the charred skin off the onion and ginger . Sometimes a spoon makes it easier to scrape the ginger skin off. Wash off any charred bits. Cut the onion in half and ginger into three pieces. With the chicken, I usually allow it to sit at room temperature for about half an hour to one hour to take the chill of it. Place the whole chicken into a large stockpot where the chicken will fit snugly and cover it with cold water. Cover the pot with a lid and bring the water to a gentle boil and allow the chicken to simmer for 5 minutes. Remove the chicken and pour out the water with the impurities and clean the pot. Return the chicken to the pot, cover with the 8 cups of water and add the onion, ginger, coriander root and roasted spices into the pot along with the sugar and fish sauce. You can add a little extra water if it’s not enough to cover the chicken but be careful of diluting the soup too much. Bring the water to a gentle boil and reduce the heat to a simmer for approximately 30-35 minutes with the lid off. If there is any impurities or excessive fat, skim this off to keep the stock as clear as possible. When the chicken is ready, the meat should feel firm but still juicy. Remove the chicken from the pot with tongs and allow the stock to continue simmering over low heat. You can either place the chicken in a large ice bath or rinse with cold water and allow it to drain properly. After a little while, it’ll be cool enough to handle and you’ll strip the breast, thigh and leg meat off the bones. Try to keep the breasts intact, don’t shred the meat at this point, otherwise it’ll dry out. Keep the pieces fairly large and cover with cling film and refrigerate till needed. Break into the carcass a little to expose more marrow and return this and any other bones back into the stock. Simmer for at least another hour. When ready, strain the soup through a fine metal sieve lined with cheese cloth or even a clean chux into a clean pot and bring to a simmer. Taste the stock and season with extra fish sauce, a little salt and sugar if needed. To serve, divide the noodles between large soup bowls (if the noodles have been refrigerated, heat each serving up for 1 minute in the microwave till they soften). The chicken can be sliced or shredded into smaller pieces and divided between the bowls – I usually remove the skin but if you’re going to keep the skin on, it’s better to slice the chicken. Spoon hot soup over the noodles and top with onion, coriander leaves and spring onion. People can add their own bean sprouts into the hot soup as well as the thai basil and chilli slices. I like to taste the broth before giving a squeeze of lemon juice. I never add the sauces directly into the soup but rather place them in a small sauce dish with an even split of the hoisin and Vietnamese sate sauce – I dip the meat into the sauces throughout the meal.